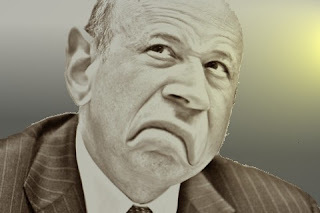 Goldman Sachs: Information, Comments, Opinions and Facts: Goldman feeling the heat ? Goldman feeling the heat ? Editors note: Matt Taibbi has been one of the very few in the MSM that has dared to speak the truth about Goldman. Here's his latest piece. You acknowledge that we may monitor your use of the Services for our own purposes (and not for your benefit). We may use the resulting information for internal business purposes or in accordance with the rules of any applicable regulatory or self-regulatory body and in compliance with applicable law and regulation. via Is Goldman Legally Frontrunning Its Clients? zero hedge. After watching its thoroughly maladroit handling of several p.r. problems this week, I’m absolutely convinced that Goldman Sachs can be hurt if enough people keep piling on with the pressure. The latest evidence of this is its abject collapse in the face of questions from Zero Hedge about the possibility that it is using the data its takes from users of its website to front-run those same people. Front-running takes place when a bank or broker-dealer– say, Goldman, Sachs — executes a trade for its own account before filling its customer’s order. Since a large enough trade (executed by institutional investors, for instance) can actually move the price of the security in question, front-running can be a very profitable activity. It’s sort of like fast-food insider trading. It is common knowledge that front-running on Wall Street is rampant, and I interviewed more than one person for my recent Rolling Stone story who accused Goldman of front-running its big clients in all sorts of arenas, from the internet IPO years to the commodities markets.